Every couple of years or so, I buy a new winter fleece dressing gown, usually from Best & Less. When I saw their plush gowns in store this year, I was not impressed, so set out to make my own. When I told some non-sewers they were shocked and proceeded to tell me where I could get a great dressing gown. I had looked at all the catalogues that make their way into my letter box, and again, I was not impressed with what was on offer. Fleece seemed to have given way to Plush. 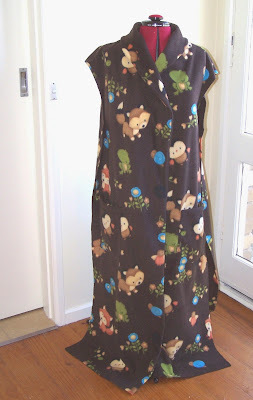 My house is too cold for a Plush gown, so I bought Butterick 5537 and set about making my own. I went on the look of the dressing gown picture on the pattern cover (I am making view A) and did not stop to check whether it could be sewn up using fleece. They recommend single sided fleece but not double. I have never sewn with fleece and when I checked Sandra Betzina's book More Fabric Savy, she states that you simply cannot iron the stuff. So imagine the fun I had getting those patch pockets on the front. I had to hand baste the corners and then pin the blazes out of them so they stayed in place while I sewed them on. The result is not too bad, but it explains why my bought ones have in-seam pockets. 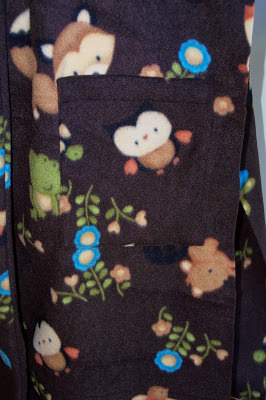 I also got tempted at Spotlight and bought some fleece (also double-sided) to make another one. 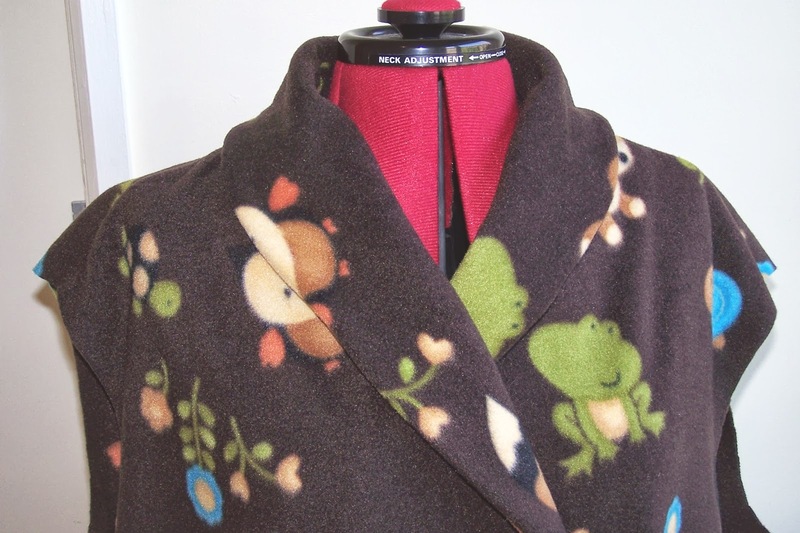 This fleece is anti-pill, and is designed for out-door wear, so it should make a cosy dressing gown. 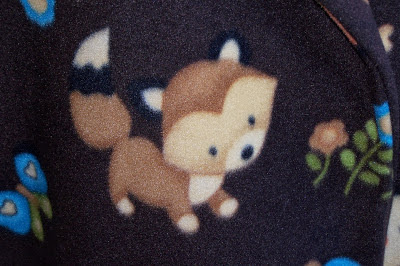 I gotted 'sucked in' by the cute animal pics on this brown fabric which I think is more suitable for my 6 year old niece, but I like it. I cut out the same owl motif for each pocket. I lightened the previous 2 photos so you could see the detail, but didn't for this photo. Despite the no-iron issue, it is coming together well, and I should have it finished soon. Then I am planning to make a winter top for myself as those dolls have been getting so much, my wardrobe is looking decidedly patchy. You did a lovely job on it and I like the happy looking animals too. 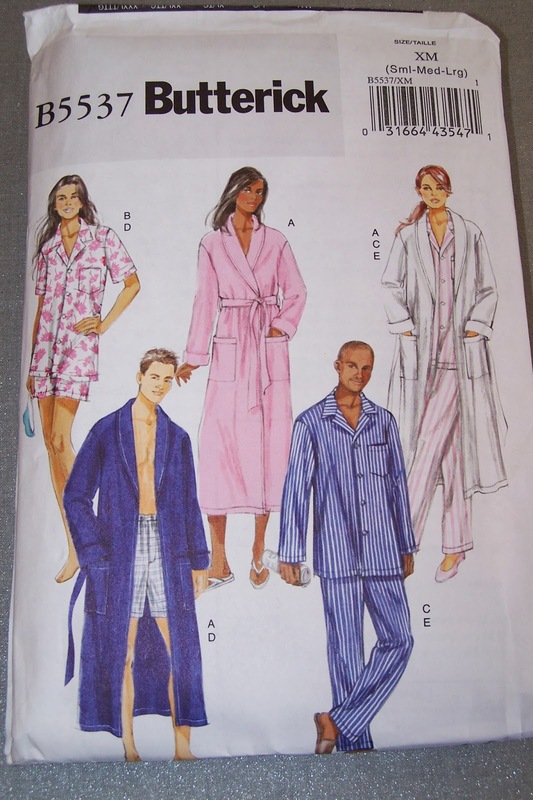 Yes, it's hard to find the perfect dressing gown--I don't like ones that zip or button, it has to be the right color and weight and fabric. I made one out of flannel once that I really liked but it finally wore out. Fleece is a good choice. Did you have any problems sewing on the fleece? My old Singer doesn't like it and often skips stitches. I have to be sure I have a stretch needle, not a ballpoint, and even then it doesn't always work. Hi Audra, Sandra Betzina states that fleece is not needle particular. My Janome sewing machine is about 6 years old and fairly basic and is sewing it up quite nicely. My Janome switches over to stretch stich mode and has a kind of an overlock /serger stitch. This seems to be working so well I might use it to sew a stretch top although you can't adjust it as much as you would a serger. Sandra B also suggests a 3.00 mm straight stitch, so that might help your Singer. I love the sound of your flannel gown. I am thinking of making one in cotton for warmer months. Thanks Laura Lee, I am glad to hear that you appear to be as particular about them as I am.